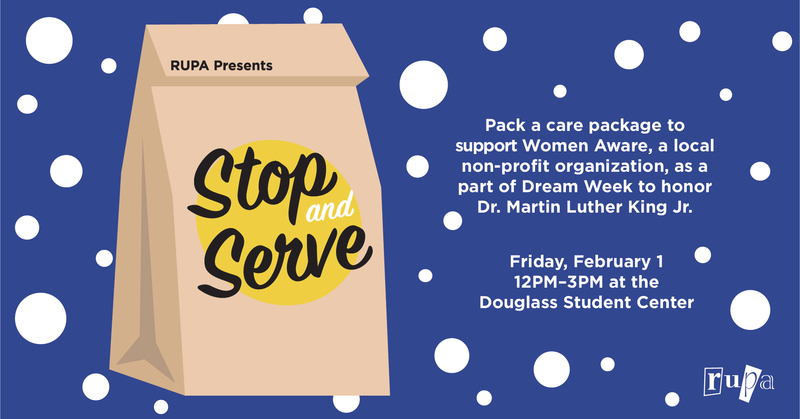 Come on out to our Stop and Serve event being held as part of Dream Week! This week is centered around the remembrance and celebration of Dr. Martin Luther King Jr., and in honoring Dr. King, we will be partnering with the Cultural Center Collaborative to benefit those in local Women’s shelters. The event will be centered around packaging toiletries and cosmetics such as deodorant, sanitary napkins, lip balm, wet wipes, and makeup packages. Come on out to help us make this Dream Week a success! Taking place at the Douglass Student Center this Friday (2/1) from 12 PM to 3 PM!